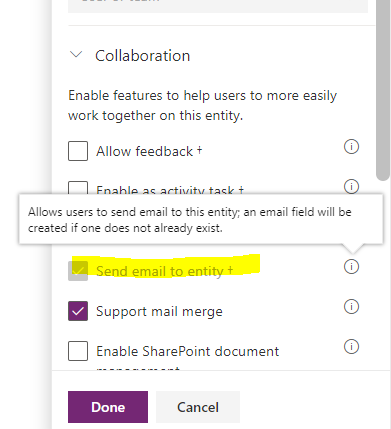 Making an entity enabled to send emails in Dynamics 365 and it’s existing email fields – Gotchas! After my last blog on canvas app and OPEN API, I would say this one is pretty basic. However time and again I keep hearing kind of similar questions based on this topic and hence I thought of penning this blog. Well there are two questions usually that I face. How do I make my custom entity email able?. In other words, how can I select my custom entity in the To, CC, BCC section of email? If I have more than one email field already available before I enable this setting, which one would it take while sending email? Well above is a view from the new powerapps admin center. In case you are still working on the old version, this is what it would look like. Well you may be thinking what’s new. After all this is know. When we select this option, a new field of format “Email” would be created and that will be used to receive emails from CRM. Wait..but what about the second question? Well in that case, the email field which was created first would be used for sending the email. Small one but next time if someone pops this question, you can just steal the show by letting out this small secret.